In early April of this year, UNAVCO visited the Barrow Arctic Science Consortium (BASC) in order to conduct the annual inventory of the GPS equipment on loan to BASC, and to train both BASC science support staff members and University of Alaska Fairbanks researchers. Throughout the year, the BASC science support staff is responsible for managing the use of the equipment and training visiting scientists on how to use the DGPS system. The station is currently equipped with a NetRS base station, two rover units comprised of an R7 and an R8 all-in-one receiver and antenna unit, and a variety of field gear, such as backpacks, range poles, bipods, and tripods. The NetRS broadcasts an RTK signal, which can be extended to farther regions using a repeater. Permanent GPS station SG27 was also visited to perform maintenance and documentation tasks. The station, which was installed in 2002, is located at the NOAA CMDL Facility, which is a few kilometers southwest from the BASC building. During the site visit, a new UPS for the NetRS was installed inside the building, and photos of the receiver location and power supply were taken as no such records existed. 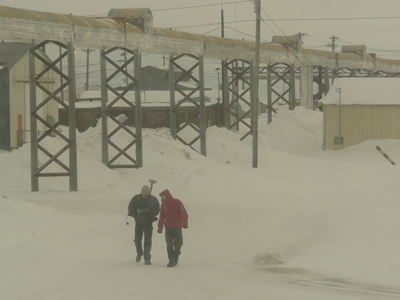 Figure 1 -Two graduate students from the Floating Ice Group of the University of Alaska Fairbanks train on the Trimble equipment around the BASC facility.